The process of moving aboard is exciting, and hard. We’re selling our stuff and doing what we love. Tough job. We’ve been in this house for twenty years, amassing furniture, building materials, tools, art, toys, books (OMG, the books) and memories. The physical part is one kind of hard – all these boxes to navigate around, all the furniture to lift and carry out to people’s trucks. Soon we’ll be sleeping on the floor again like we did when we moved into our first apartment. Then there are all the phone calls and appointments to schedule. We’ve lost track of who got here first on a couple of items, which caused some heartburn. Then there’s the step-by-step process of listing things on Etsy, Ebay and our Drewslist linked Moving Aboard Sale site. Then there’s the act of letting go. This morning I was creating a couple more listings for special things on my Etsy vintage store, As She Goes and ran into difficulties in the shape of a pig. 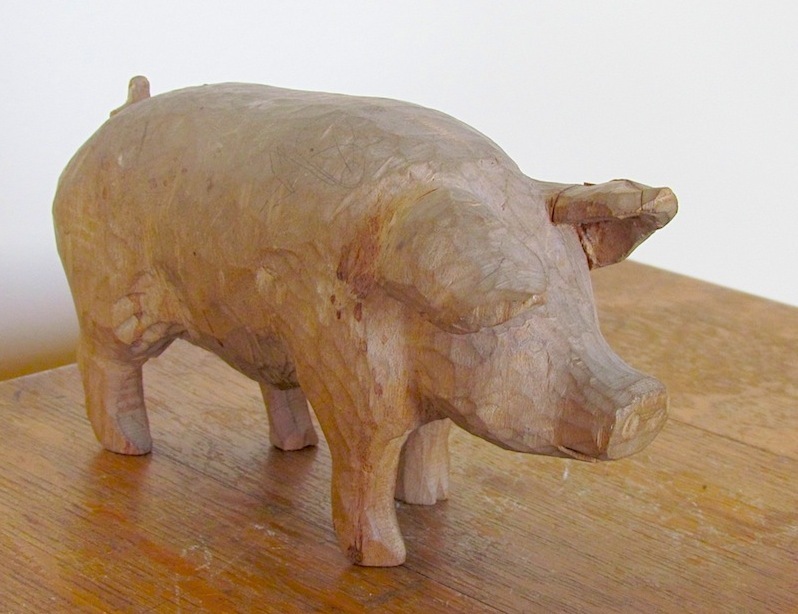 This charming porker began life as a carving lesson. My husband, Tom, sat with the kids each night after work teaching them the whole process. First they learned how to choose a good block of wood. Then they voted on what the subject would be. (I think they might have been reading Charlotte’s Web at the time.) Next they studied pig anatomy and sketched pigs in a variety of poses. After they came up with the perfect design, he showed them how to lay out the shape on the block of wood. Then the carving began, night by night, the form of Wilbur took shape. When the pig was finished, complete with curly tail – he, and it is a he – became a favorite plaything. When the kids were grown, he took his folk-art place on the living room window sill and waited for the grandkids to arrive. Now they love him too. Over the years he’s lost most of his tail. An ear came off in one piggy frolic and had to be glued back on. Still, everyone, kids and adults alike, picks him up. His strong back has developed quite a patina. Never mind, I don’t want to sell this. All the kids grew up to be artists. Mari is a photographer and painter, Emily crafts handmade books and Jeremy carves. Sticks he turned into various implements littered our house. 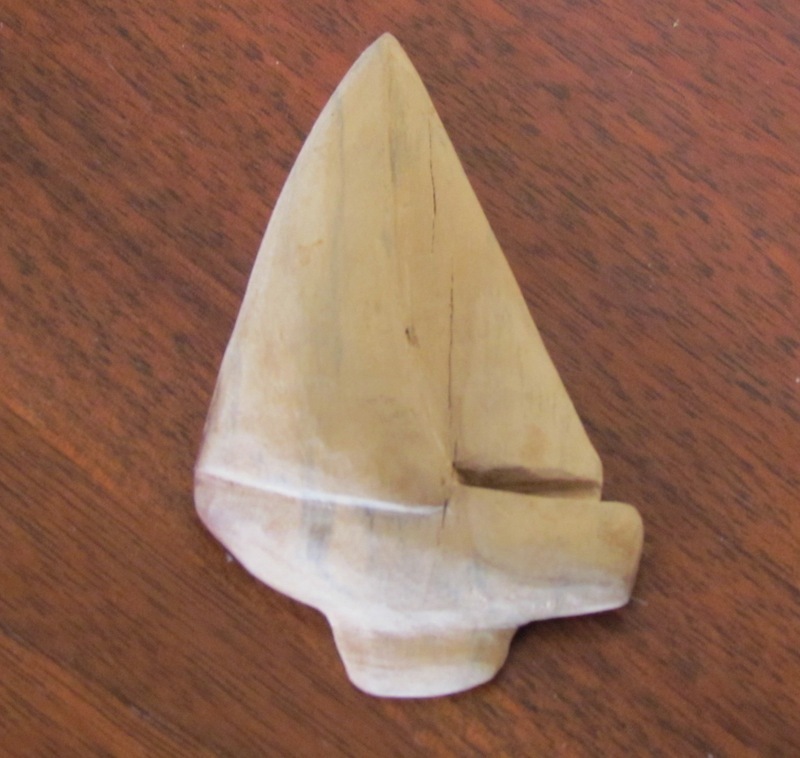 Here’s one of his carvings from a few years after the pig lesson that shows the trend toward the water. Later he moved on to stone – we’ll be hauling a box of stone carving tools with us when we head east in a few weeks. 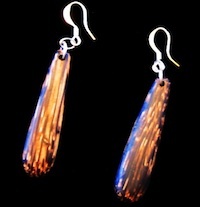 After a stint with silver jewelry, now he’s combined wood and jewelry and carves gorgeous earrings and pendants from small pieces of exotic hardwoods. So how can I part with this pig that started it all? (And this lamp … and this thermos?) Thank goodness for Mom’s attic, cuz I’m having trouble letting go. I love that pig! I’ll keep him and your grandkids will deepen the patina. I’m so excited for your adventure but so sad to see things go I wish I could keep every thing.